Carl Richardson was diagnosed with Usher II when he was seventeen years old. He also has a sister, Annie, who has Usher syndrome. Carl Richardson is currently the Americans with Disabilities Act (ADA) Coordinator for the Massachusetts State House where it is his role to work with the executive and legislative branch collaboratively to ensure that all the State House’s many programs, services, and activities are fully and equally accessible to people of all abilities. Carl is a director for two boards; Very Special Arts of Massachusetts and the Carroll Center for the Blind. 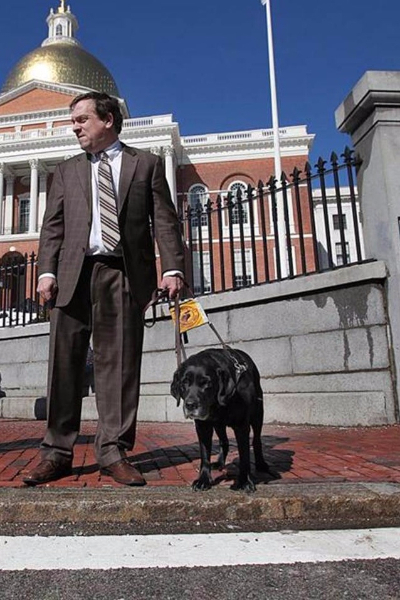 He also serves on several committees which include the American Council of the Blind, Deaf Blind Community Access Network, Guide Dog User Group of Massachusetts, and the City of Boston’s Mayor Commission for Persons with Disabilities. Hello to all the readers of this blog. My name is Carl Richardson and I have Usher syndrome. I feel like I just did what a recovering alcoholic does when he announces himself at an AA meeting. Perhaps the steps of Usher syndrome and AA are similar; people with Usher experience denial, acceptance, and they learn how to live with Usher, just as one has to learn how to live with alcoholism. Just like alcoholism, Usher syndrome never goes away, but one can lead a very good and fulfilling life with it. I have been promising Mark I would write for this blog for over a year now but I have been procrastinating. One reason is that I do not think I am a good writer, especially since I am married to one. Many of you probably read her piece a few months ago on what it is like to live with a partner who has Usher. The other reason is that I know firsthand that many people and families are at different stages in how they are dealing with Usher syndrome. Simply because I may have a different perspective doesn’t mean another Usher person is wrong. All feelings and ways of dealing with Usher are valid. Back in July, Mark wrote a piece entitled “Uncertainty and Uncertainty” which compared Usher to Cancer. I know Mark was saying that his daughter Bella and his wife Julia have each other and that no matter what, they will get through it. But I was thinking that cancer is far worse than Usher syndrome can ever be. While Mark was right that both conditions have uncertainty, we do know the full potential impact of Usher. 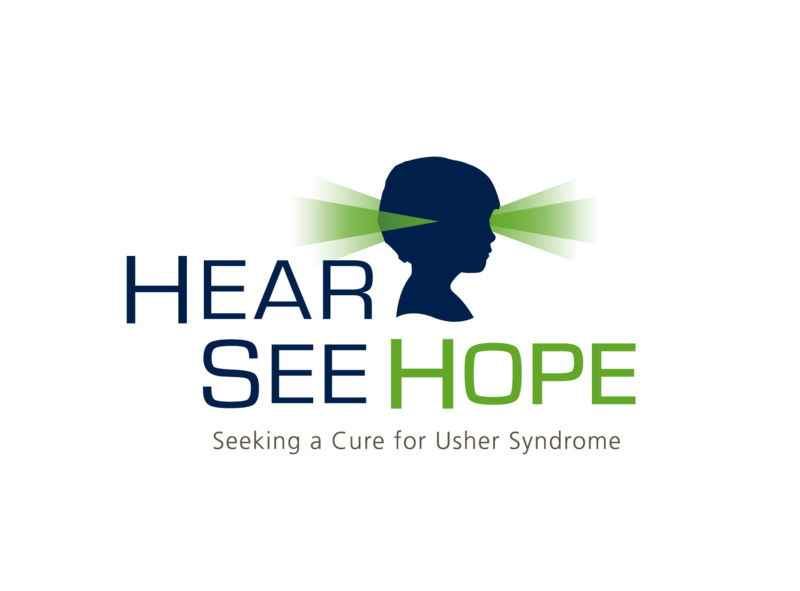 While we do not know when we will lose all of our hearing or vision, we can take steps to improve the quality of life as we progress through our journey with Usher syndrome. As one who recently lost a father to cancer, I can say I am not sure one can ever prepare nor take the steps necessary to deal with that fully. Having Usher is certainly frustrating and life changing, but if you get anything from my attempt to write this piece, I want all of you to understand that I truly believe that a person who has Usher can have a very good and fulfilling life. I am one of the luckiest people I know; I have an amazing life, a very good job, many who I am proud to call my friends, and a loving and supportive family. 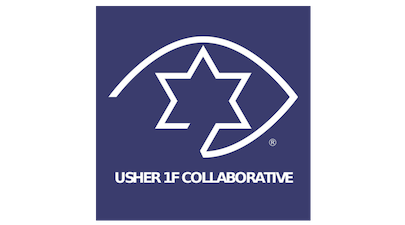 I have always contended that having Usher is like being a tight rope walker, because you have to walk a fine line with just the right amount of balance in your life, or you will tip to one side and fall off the wire. On one hand you want to have hope and wish for a cure, but if you spend your whole life hoping for that, you may remain in denial and not take the steps necessary to get the tools you need to succeed. On the other hand if you are too much of a pragmatist you may get depressed and not want to do things if you think the only thing you have to look forward to is complete deaf blindness. How do you maintain that balance so that you can walk that tightrope? I am also fortunate, because I feel that genetics not only gave me Usher, but also gave me my father’s disposition in how I deal with my Usher. My father once told me that no one in life gets off scot free; everyone has a cross to bear and we all have to deal with it. I still remember that conversation vividly. The only difference with my cross is that mine is visible and everyone sees me bearing it. I wear two hearing aids and I have a guide dog so I am not fooling anyone. Because I am so visible, I feel I have to be very good about how I present myself. I may be the only person someone meets that is deaf blind, so it is very important for me to leave a good impression so that people will think that we in the deaf blind community are capable of accomplishing anything and are people with feelings, emotions, and dreams just like anyone else. I also have a job where I meet people across the disability spectrum, from minor ones to life threatening ones. I meet people from all ethnic, economic, and religious backgrounds and this keeps me grounded. I have met many brave, courageous, and amazing people who have far more to deal with than I do and I have even aspired to be like many of them. I was diagnosed almost 30 years ago with Usher when I still had 20/20 vision. I was seventeen and I thought the whole world was ahead of me. I was still driving, I was going to go to college to be a filmmaker and take on Hollywood! Well, that hasn’t worked out but not necessarily because of my Usher; there were lots of other factors. But now thirty years later, I cannot drive, cannot read standard print, and even have difficulty doing my first love: watching movies. 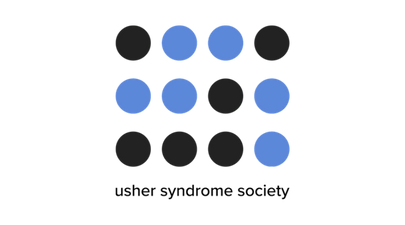 This is the part where I talk about how I, with the help of many including the Massachusetts Commission for the Blind, took steps to mitigate those things. When I gave up driving, I hated it; I felt like I lost my independence and felt like less of a human being. It took me a while but I finally figured out, with the help of my dad, that to move into the city would be the best thing to do. Then I would be on equal footing with everyone else who is taking public transportation and does not have a car. When I got night blindness to the point where I was afraid to go out independently, I learned how to use a cane so I could go out myself. When my vision got worse to the point where it was hard to rely on both my hearing and vision to do traffic crossings, I got a guide dog. When I lost the ability to read standard print, I learned how to use audio books and use a screen reader to access the computer and the internet. When I started having difficulty viewing movies, I learned about audio description, which is a service that many movie theaters provide to enhance the viewing of the film for the visually impaired community. You get a headset and listen to a separate track that describes the key visual elements of the film. It is not the same but at least I can go out on a date with my wife and watch a film and enjoy it. Sometimes I even go to the movies by myself, as my wife and I like different movies. You should see the expression of the theater staff when I show up with a guide dog and ask for a ticket to a film. I love changing people’s perceptions! When smart phones came out, at first I felt left out. People were able to do all these amazing things such as use social media, email, and look up things. I was extremely disappointed because I never thought I would be able to do those things and keep up with my peers. I was wrong! A good friend of mine who is completely blind showed me his Apple iPhone and how it did anything a sighted person could do. I bought one and it has changed my life. My wife says I love it more than her. She might be right as I do go to bed with it and wake up with it. I do not want to say any of this is easy and a piece of cake. It is far from that. My wife will tell you that sometimes I am a bit impatient and short tempered (although I probably would be even without my Usher). Also, all those steps I took above take a lot of time, planning, effort, and a certain amount of fortitude. For instance, it took me several years to finally admit I could not read and needed to use a screen reader because I felt like I was still reading even if it was at 8 times the normal magnification and it took me all day and wore me out mentally and physically. I finally realized I was more efficient using a screen reader. I am writing this using one. Now I am 47, and although I feel like I have a good life, I still have challenges with respect to my Usher, but I refuse to let it define who I am. I do not blame the Usher syndrome. I just happen to be a person who has Usher syndrome. I still have challenges, but I figure out a way to deal with them. For instance, I am currently going to a local university to obtain a Master’s degree. I am working on a research paper. I have not written a research paper in almost 25 years and find it to be more challenging than I thought it would be. Again, I don’t feel confident in my writing. Aside from keeping up with the young students, I had to learn how to research using the internet which is not something we did in my day when I got my Bachelor’s. Upon conducting my research, I learned that most of the research materials are not accessible. But instead of blaming Usher syndrome and the fact I cannot read standard print, I blamed the fact that both the internet and many of the libraries I was accessing were not following both the ADA and Section 508. I have the same rights as others. When I approached a librarian about this, he said the library would be happy to sit with me and read all the materials to me. This is not acceptable to me. I want to access the material independently as others do. I don’t blame Usher syndrome for this problem. It is ignorance about the needs of people with Usher syndrome. At some point, I will be reaching out to those in the university system and libraries to see if we can’t change how blind and visually impaired students go about doing research. In summary, I want individuals that have been diagnosed with Usher, their family members, and society at large to know that one with a disability can lead a very good, productive and fulfilling life. It is important that you know that. You may be going through a difficult time, but I want you to know that life can be good -- in fact, very good! I would love to hear from others reading this and learn about the ways that some of you cope with Usher. Or if any of you have a question on how I deal with a particular topic or coping mechanism. Perhaps that will give me future topics to write about. 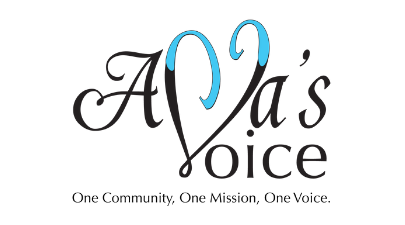 I would also encourage any of you who want to contribute to please do so, as I feel that we all have a voice and can only learn from each other. 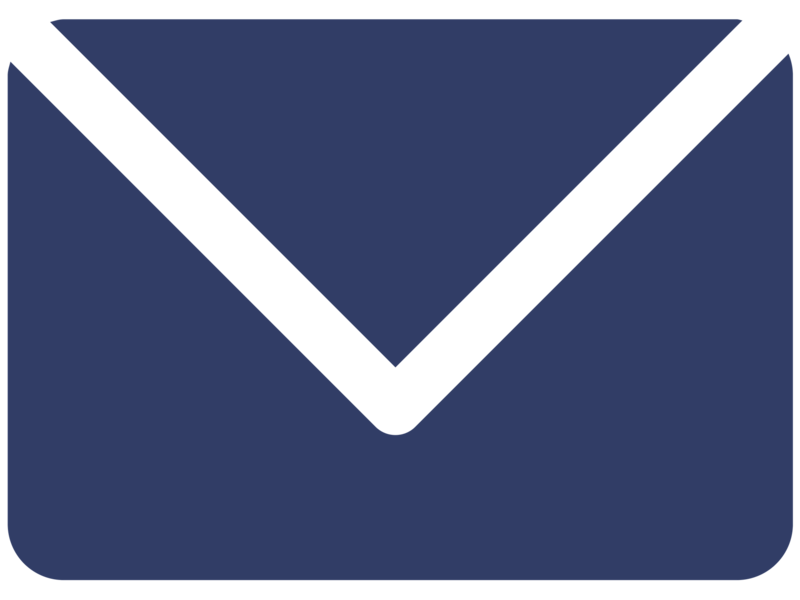 If anyone wants to get in touch with me, please feel free to do so anytime at carl@carl-richardson.com. I look forward to our dialogue!